Environmental Protection Agency (EPA) Administrator Andrew Wheeler said the agency would “absolutely” move forward with a rule to keep so-called “secret science” out of the regulatory process. “We are absolutely going to follow through with the science transparency rule,” Wheeler told The Daily Caller News Foundation in an interview at the Conservative Political Action Conference (CPAC). “I think it’s very important,” said Wheeler, referring to a rule proposed by his predecessor Scott Pruitt that would require making underlying data EPA uses to craft regulations available to the public and other researchers. Pruitt proposed reversing EPA’s long-standing practice of relying on non-public scientific data in crafting rules in 2018. Republicans called such studies “secret science” and pointed out tens of billions of dollars in regulations have been based on non-public data. Environmentalists and Democrats opposed the rule, arguing it would expose confidential health and business information — a charge that was largely rebutted by proponents. However, since Pruitt’s departure from EPA, the fate of the “secret science” rule has been unclear. “My first job at EPA in 1991, straight out of law school, was working in the toxics office, the chemicals office, and I worked on something called the Community Right To Know Act,” Wheeler said. “I fundamentally believe the more information we put out to the American public, the more sound our environmental regulations will be,” he continued. Wheeler joined EPA in 2018 as deputy administrator, but was quickly made acting head of the agency after Pruitt resigned in July. The Senate confirmed Wheeler as EPA’s official head in late February. 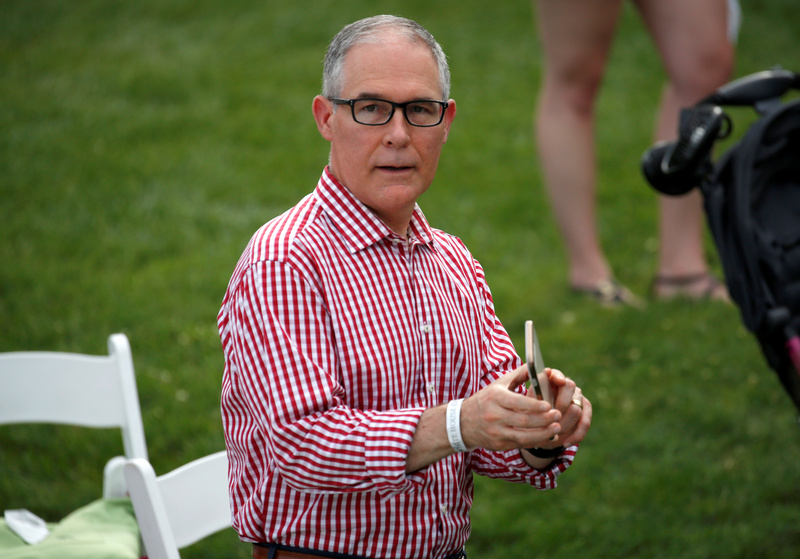 Administrator of the Environmental Protection Agency Scott Pruitt holds a mobile phone during a picnic for military families celebrating Independence Day at the White House in Washington, U.S., July 4, 2018. REUTERS/Joshua Roberts. In the interview, Wheeler also touched on further plans to repeal Obama-era regulations, breaking off talks with California on fuel economy regulations and the Green New Deal. Democratic New York Rep. Alexandria Ocasio-Cortez and Massachusetts Sen. Ed Markey introduced the Green New Deal in February, which called for a massive transformation of the U.S. economy to fight global warming. Many Democrats running for president in 2020 endorsed it. Wheeler said the Green New Deal is “not ready for prime time” and would likely tank the U.S. economy.